A legitimate load for those looking to do more for less out of their high end rifles. 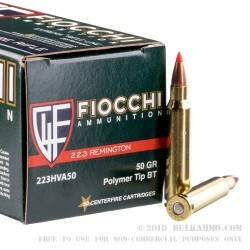 The Fiocchi .223 with the 50 grain V-MAX is a bargain priced ammunition considering what it can do on the range and in such a wide variety of firearms. 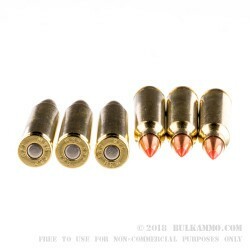 The V-MAX polymer tipped projectile is a special bullet by itself; pairing that with a quality piece of brass, a boxer primer more than a century of modern ammunition production experience and complete control over the production of components, and the Hornady bullet with the Fiocchi Italian manufacture turn into a super accurate load with myriad possibilities. With 3 gun becoming so popular of late, it’s an interesting round to feed continuously to your rifle, because it’s match grade, but priced as a range load. Out to 300 yards it’s capable of sub MOA out of specially tuned rifles. 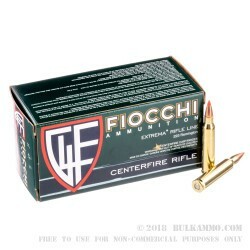 Most .223 ammunition has a hard time staying on a 6” target at 300 yards +; which proves the point here: Fiocchi is producing great stuff; when combined with amazing components like the Hornady V-MAX, something truly special at a super low price point is possible. Suitable for anything that chambers a .223 Remington cartridge, this is a premium round at a pauper’s price. FIrst let me say BA is great! Fast Shipping great selection and fair pricing....keep up the good work guys! After a LONG hiatus from shooting, I jumped back in this year full bore and I'm having a blast with my new DMPS 3Gun. My rifle just LOVES this stuff. No better ammo have I yet to find for my rifle. I was shooting groups so tight at 300 yrds I thought I was missing the target. When I got out to the target I was shocked that nearly all my rounds were in a 2" group and I was shooting from my bi-pod. I just bought a sled for Christmas....can't wait to see the results with that. 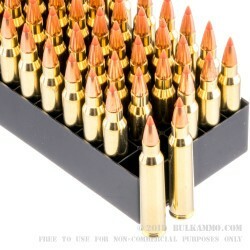 This ammo is very clean and shoots MUCH cleaner than the PMC 5.56 62grain ammo I had also purchased here. I have run well over a 1000 rounds w/o a single misfire, jam or hiccup.